This project was in the making for over a year and features all available 14 Poecilotheria species in the hobby, including all the adult males, in a total of 30 stacked images! 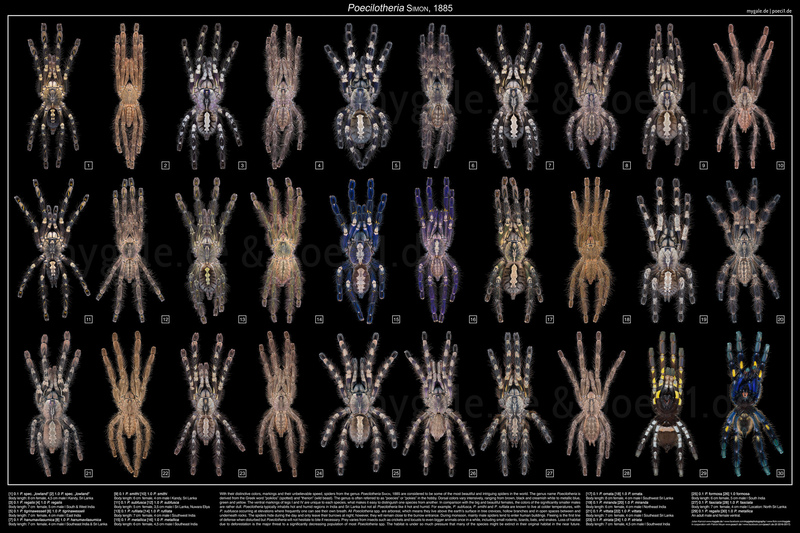 With over 650 Megapixels it shows this genus with all the details it deserves and is the biggest, most advanced and detailed Poecilotheria poster ever made. Prints up to 4 meters are easily possible. All images are stacked and often made up of 3 to 8 individual images to give an entirely sharp image. It also features the origin and body length for every species and additional text with general information. The text was written by Dennis Van Vlierberghe (BE), Danniella Sherwood (UK) and Tobias Hauke (DE). This poster was the fastest selling series ever and was almost sold out on day one. It’s available on arachnogear.com only. As I’m always trying to beat the previous project, this one layed the next milestone. It was the first project ever that got officially announced with its own promo images/banner and 2K/5K wallpapers. All rights reserved © 2016 – 2017.